I bought a book just because I liked the look of the cake pictured on the cover. 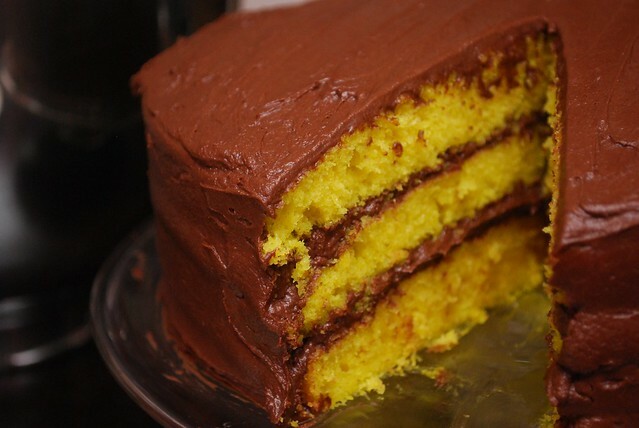 Bright fluffy yellow cake layered with thick chocolate frosting. I bought--and read--that book just because I wanted to taste the cake. It's not a cookbook; there was no recipe, though I most enjoyed the few pages that described in detail the way the cake was made. The story ended up being stranger than I expected. Instead of sweetness and tea and cozy kitchen stories, it talked about a girl who tasted in everything she ate the secrets and emotions of the person who cooked it. She tasted her mother's sadness (the particular kind alluded to in the book's title), her brother's emptiness, the cold metallic behind factory-processed food. It is a plot with the potential for incredible things, but I was disappointed. In the end, it was the picture of the cake that inspired me the most. I started with a basic lemon cake recipe, tweaking it as i went along. I added yellow food coloring until the batter matched the hue in the painting. The frosting was the simple one, learned from the back of the cocoa box 15 or so years ago. Chocolate and lemon is an unexpected combination, at least as far as cakes are concerned, but the final results are stunning. 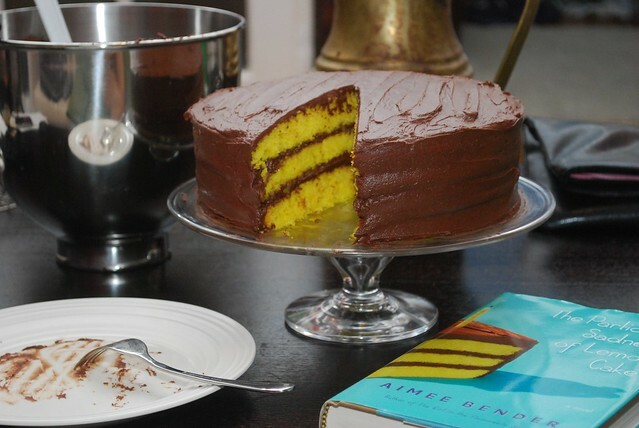 The tartness of the lemon cake is cool and bright against the sweet cocoa frosting. Next time I think I'll take it a bit further and add a thin layer of lemon curd right in the middle. 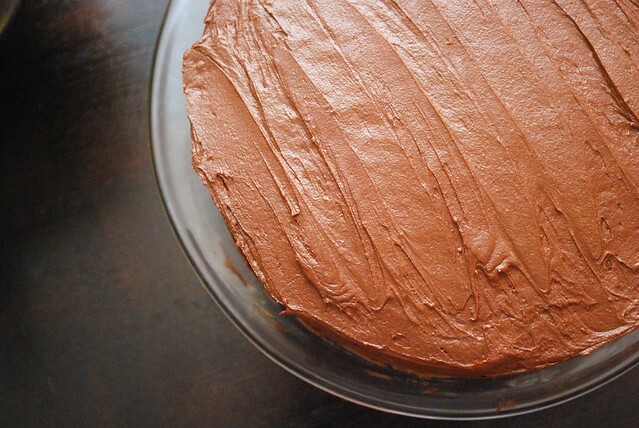 I frosted my pretty cake right on the coffee table, and was practically falling over myself in my eagerness to take a bite. 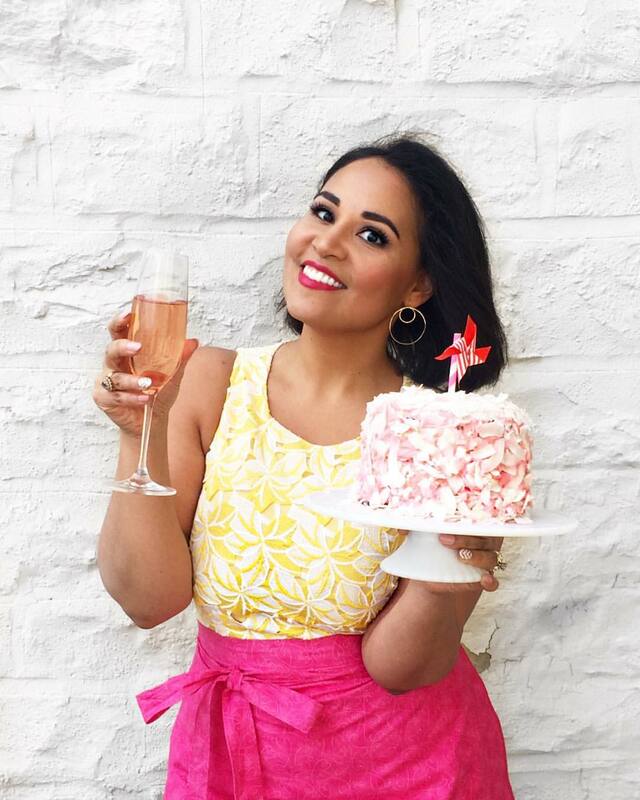 There was no sadness in my cake; just bright, sweet joy. Preheat oven to 375 degrees and grease and flour three 9" round baking pans. Set aside. In the base of an electric mixer, combine the butter and sugar and beat until pale and fluffy. Add in the egg yolks and continue to beat at high speed for about 5 minutes. Add the lemon zest, juice, and vanilla and continue to beat for another minute. While the egg mixture beats, combine the flour, baking powder, and salt. Lower the speed on the mixer (to keep the flour from flying all over your kitchen) and gently add to the butter mixture in thirds, alternating with the whole milk until all have been added and just until all have been combined. If using, gently stir in about a teaspoon of yellow liquid food coloring until evenly distributed. Use more if a brighter yellow color is desired. 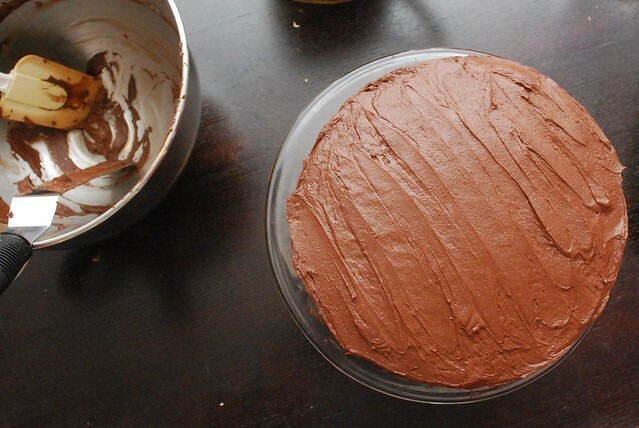 Divide the batter evenly between the three cake pans and bake for about 12 to 15 minutes or until a tester inserted in the center comes out clean. Flip out onto wire racks and let cool completely before frosting with Basic Cocoa Frosting (recipe below).